As soon as the House met for the day, Congress members trooped into the Well of the House with placards, demanding a Joint Parliamentary Committee probe into the Rafale deal. NEW DELHI: Lok Sabha was repeatedly adjourned on Monday following protests by Congress, SP and other parties over various issues. A lone AIADMK member was also in the Well, protesting the construction of a dam across the Cauvery river. He was joined by a TDP member, who was dressed like former Tamil Nadu chief minister M G Ramachandran. Members from SP shouted slogans alleging CBI and central government "nexus" in the sand mining case. Amid the uproar, Speaker Sumitra Mahajan adjourned the proceedings till noon. 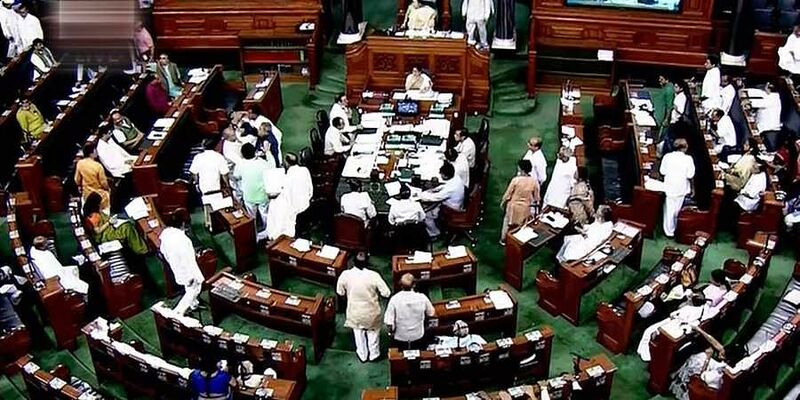 As the House met again, the protests continued and the Speaker suspended three AIADMK MPs and one TDP lawmaker for unruly behaviour. The Congress and SP members continued sloganeering and the Speaker again adjourned the House till 12.30 pm. As Lok Sabha met post lunch, members from the Congress and the SP continued their protests. Majahan then adjourned the House for 20 minutes till 2.30 pm. Amid the din, the House gave its nod to the amendments passed by the Rajya Sabha to 'Right of Children to Free and Compulsory Education (Amendment) Bill, 2018', and 'National Council for Teacher Education (Amendment) Bill, 2018'.